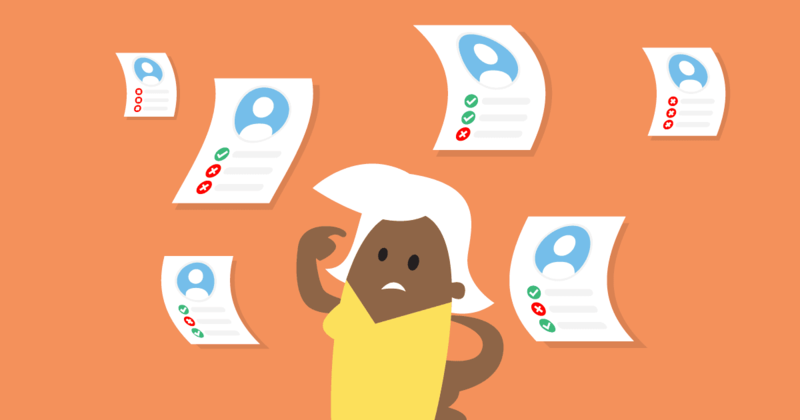 To get the best result when recruiting software testers, check the key competencies during the interview and avoid the pitfalls explained in our post. If you have ever been involved in recruiting software testers, you will already know about some of the main challenges involved. To start with, you want to hire a perfect match for the open position, but have to do so based on a two-page CV and a rather short interview. Also, the interview itself might not deliver the most accurate assessment of a candidate because some people are better at doing interviews than the job on offer. As the interviewer, you need to be able to discover the candidate’s genuine capabilities and help them demonstrate their abilities to the full extent. Another challenge can be when the recruitment process is managed by more than one specialist. For example, the job description could be composed by one person, interview held by another, and the decision made by a third, when none of them has anything to do with the project on which the successful candidate will eventually work. In this case, it’s easy to lose connection with the true needs of the project. Let’s move on to some approaches that can be helpful in avoiding these traps on your way to building a dream team. This is a starting point of any recruitment process when you understand that it’s time to look for a new team member. Gather all the job requirements and then prioritize them, listing the must-haves, nice-to-haves and those that can be ignored. At this point, you shift your focus from job requirements (‘What do we need?’) to a person you are looking for (‘Who is our ideal candidate? What is she/he able to do and how?’.) In this way, we come up with a list of target competencies, which can be checked during the later stages. Target your job post to reach the audience which you have defined above. For instance, if you are looking for students and graduates, you can make the tone of the post more casual and place it in social media, universities/colleges, youth job fairs. When targeting mature specialists, make it sound more serious and use professional social media and personal networking to spread the word. This stage is held mainly by recruiters, more rarely by testing specialists. At this point, resumes are sifted to find the candidates that are worth inviting to interview. Depending on the pool of candidates, you can be looking for a full or partial match of their competencies to the job requirements. If you are hunting for some rare competencies, try to omit unnecessary details that can narrow the pool of your potential candidates, prevent them from applying. This is where the technical specialists (like you) play the primary role. The challenge here is that technical experts may be good at testing but not so good at interviewing. The result can be communication issues, a candidate’s spoilt impression of the company, and the overall interview process made uncomfortable and/or ineffective. A more successful approach can be to base the interview on the exact competencies we want to check. So, make sure you are prepared with a list of questions/ cases and have a good reason to ask them. Depending on the competency being checked, it can be better to use an interview method such as open questions, theoretical cases, or sample tasks. Sometimes it can be informative to offer a candidate a short home task to solve. Keep in mind that not all candidates will eagerly agree to spend their time and effort on such tasks, but this method is good for when there are no other simple ways to check the competency. On the other hand, the completion of such a task can be read as a sign of the candidate’s motivation for the job. Communicating with the developer who doesn’t agree the bug is valid. In all these cases, don’t ask the respondent how they would act in theory; ask them to actually do the task in role play. It’s a rule of thumb to have 2-3 technical experts on the interview and to collect independent feedback from each of them, for several reasons. First, in case of any unforeseen circumstances, there’s no need to urgently seek another interviewer because there’s always at least one on the list. Second, it helps to run the interview more smoothly. Each expert can focus on the section they are best at, and complement each other in tasks and approaches. At the same time, having several interviewers may be more stressful for the interviewee, especially if the experts take voice sporadically, interrupt each other and switch topics all of a sudden. That’s why it’s important to have an interview plan, and clear interviewer roles assigned beforehand (who is leading and who’s assisting, who asks what and when). And of course, two heads are better than one. Feedback from one person can appear too subjective. Blind feedback provided independently by each of the experts makes a difference. The rule of thumb here is to track feedback within a few hours after the interview while it’s still fresh and no details have been forgotten. You can learn some new and valuable things at this stage – what is really important to the candidate, their motivation, values and interests. Even if the candidate isn’t the best fit for your company or doesn’t accept the offer, they will remember what they thought of the company, and it’s you who will contribute the most to helping them form that impression. Not only will the candidates recall this interview next time they are looking for the job, but also share their memories with the friends. So, use this chance to create the most attractive image of your project and company. Be nice and comforting, don’t subject the candidates to unnecessary stress, and remember that you are a host, and they are your guests. When they arrive, engage them in small talk and offer a coffee or a glass of water. Whether you liked them or not, your candidates will be waiting for feedback, and giving them the extended information on their strengths, weaknesses and things to improve would be really appreciated and valued from their side. As a rule, when you choose between candidates, the safest strategy is: ‘Better to miss a good candidate than to hire an inappropriate one’. If you have enough candidates to consider and time for the search, this approach works. In other cases, you may need to risk more, hiring the most promising ones. And most often, you’ll need to invest time and resources to grow the potential of your hire, just like you would polish a diamond. Recruiting as a whole, and interviewing in particular, are mixes of skill, art and intuition, which everyone can master, with a bit of practice and desire.